"Percussion" redirects here. For other uses, see Percussion (disambiguation). A percussion instrument is a musical instrument that is sounded by being struck or scraped by a beater (including attached or enclosed beaters or rattles); struck, scraped or rubbed by hand; or struck against another similar instrument. The percussion family is believed to include the oldest musical instruments, following the human voice. Music for pitched percussion instruments can be notated on a staff with the same treble and bass clefs used by many non-percussive instruments. Music for percussive instruments without a definite pitch can be notated with a specialist rhythm or percussion-clef; More often a bass clef is substituted for rhythm clef. The word "percussion" derives from Latin the terms: "percussio" ("to beat, strike" in the musical sense), and "percussus" (noun, "a beating"). As a noun in contemporary English, Wiktionary describes it as "the collision of two bodies to produce a sound." The term is not unique to music, but has application in medicine and weaponry, as in percussion cap. 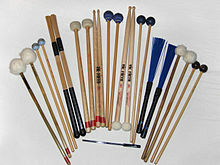 However, all known uses of percussion appear to share a similar lineage beginning with the original Latin: "percussus". In a musical context then, the percussion instruments may have been originally coined to describe a family of musical instruments including drums, rattles, metal plates, or blocks that musicians beat or struck to produce sound. 111.1 Concussion idiophones or clappers, played in pairs and beaten against each other, such as zills and clapsticks. Keyboard instruments such as the celesta and piano. Most objects commonly known as "drums" are membranophones. Membranophones produce sound when the membrane or head is struck with a hand, mallet, stick, beater, or improvised tool." Percussion instruments in this group are sometimes referred to as "pitched" or "tuned". In fact many traditionally unpitched instruments, such as triangles and even cymbals, have also been produced as tuned sets. It is difficult to define what is "common knowledge"—but there are instruments percussionists and composers use in contemporary music that most people wouldn't consider musical instruments. It is worthwhile to try to distinguish between instruments based on their acceptance or consideration by a general audience. For example, most people would not consider an anvil, a brake drum (on a vehicle with drum brakes, the circular hub the brake shoes press against), or a fifty-five gallon oil barrel musical instruments—yet composers and percussionists use these objects. It is not uncommon to discuss percussion instruments in relation to their cultural origin. This led to a division between instruments considered "common" or "modern," and folk instruments with significant history or purpose within a geographic region or culture. Ancient Chinese musical bronze bells from the Eastern Zhou Dynasty, c. 6th century BC. Melodic percussion: glass marimba, gendér, etc. The percussionist uses various objects to strike a percussion instrument to produce sound. 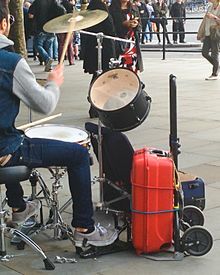 Drummer: someone who plays the drumset, hand drums or a single drum such as Snare drum. Glockenspielist: someone who plays the glockenspiel. ^ "Instruments :: Philharmonia Orchestra". Philharmonia.co.uk. Retrieved 2015-03-30. ^ "Drums from around the World • Elephant Drums". Elephant Drums. 2019-03-13. Retrieved 2019-03-13. 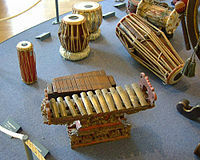 ^ Note however that percussion instruments such as the xylophone, which share the layout of the piano keyboard but themselves have no keyboard, are termed keyboard percussion and are universally regarded as being within the percussion family. James Blades, Percussion Instruments and Their History, (1970). Shen, Sinyan, Acoustics of Ancient Chinese Bells, Scientific American, 256, 94 (1987). Schick, Steven (May 2006). The Percussionist's Art – Same Bed, Different Dreams. University of Rochester Press. ISBN 978-1-58046-214-3. Wikimedia Commons has media related to Percussion instruments.